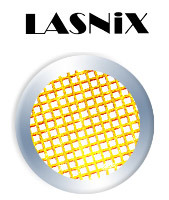 LASNIX step attenuators are precision instruments to reduce laser beam power. All other beam parameters stay unaffected. 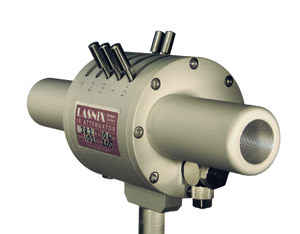 The attenuators are designed for simple alignment and ease of use. The attenuation principle is based on proprietary free-standing metal grid technology introduced by LASNIX in 1984. Originally developed for high-power CO2 lasers, these grids have been tailored to accomodate the complete infrared spectrum from 0.7 to 1200 µm. Remarkably high power handling up to 300 W c.w. has been achieved. Since the grids are freely suspended, i.e. have no substrate, they can not deviate or offset the beam - in contrast to usual, substrate-bound optical elements. Dispersion of fs pulses is negligible. In the attenuator, precision fabricated metal grids diffract a calibrated percentage of power out of the beam. The rejected power is absorbed in the walls of the water-coolable housing. The attenuated transmitted beam passes undeviated (in diffraction terms this beam represents the zeroth order). The mode structure and other beam properties, including the divergence and M2 parameters are fully preserved, as well as the polarization.